The USA had a fairly decent selections of Plushes or stuffed animals to chose from. But, just because you can pick them, doesn't always mean you'd WANT to. 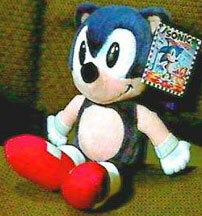 Plushes in the past only came in two varieties (unlike Japan) you could have Sonic, or Tails. No one else. 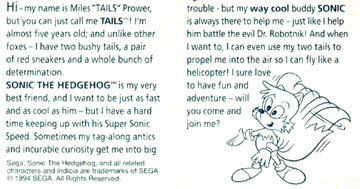 Tails also got the short end of the thread, as designers couldn't ever quite seem to grasp his concept and create a good Look-Alike. 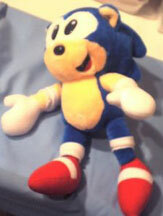 This is a rather old Sonic doll. It probably appeared around the time of Sonic 1. Note that it is quite hairy. This is before the time that makers grasped the concept that Sonic is not covered in a rich fuzzy coat of strange hair somewhat like a mink or a golden retriever. This one has a funny small nose. 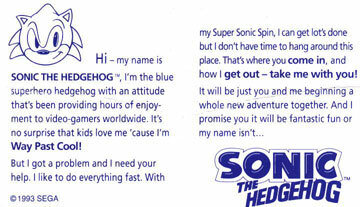 Here's another oldie, from around Sonic 1. Note the oldskool art on his tag. This one is signifigantly less hairy then the previous doll. It retains small hands, but the nose is much larger. This one has small, teddy-bear like ears. Notice the Tails. He isn't really orange. It is actually an annoying brown color. Archie comics had the same problem, making him brown like a normal "Earth Fox" because they could not grasp the concept that he too, is an unnatural color. The Tails has a "Fur" forelock or bangs, giving it a sort of poofy look. The main benefit to the above dolls is that they were produced for quite an extended amount of time. Because of that, there weren't really any big sell outs, price crunches or monsterous Ebay demands. It should still be easy for you to aquire one of these guys. A Classic doll will do your collection some good. Both of these guys are from Caltoy, and are around 13 inches high. Tag image sizes kept large so you can read them right off the picture. 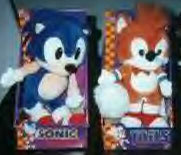 Sonic's tag is dated 1993, and Tails' is dated 1994. Here they are with turn-arounds for their box. 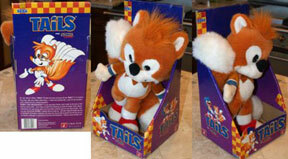 Tails is quite sadly...ugly, with a huge nose and off-color. The giant-ness of the nose may have been fixed in later dolls. 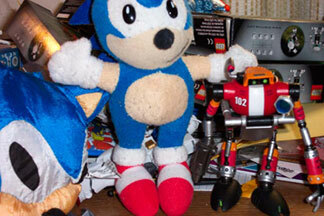 Sonic always remained fairly solid and cute. Left/Right photo discovered by: Trogdorbad. Here are some charming Sonics. They are both quite happy! These both have a 'toony' look to them, but because they are so smily, they are still cute to collect. The one on the right is rather unique. First, it is one of the few to feature a hard plastic button like nose. This stops the "Christmas Light Nose Syndrome" that Sonic can get if one is not careful. Also, it has mitten-hands with no fingers. The one on the left has a big smile, simple hands and very small feet. Whoever did the shoot, has included a ruler. Fat Sonic! This chubby plush is on a wood Rocking Chair for size reference. This one is not all that attractive...tiny eyes, huge nose, and fat features. This one is made of a smooth coarse looking cloth. It has single-layer flat felt spikes. A fuzzier Sonic, with the same single layer felt spikes. This one is smaller, and has tiny hands, but they bothered to give him fingers. That's right, his shoes have NO stripe! Why could this be? 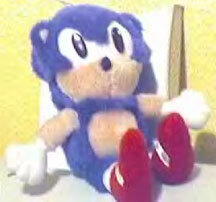 Is this some kind of bootleg Ronic the Hedgehog? It doesn't seem to be all that poorly made...just one detail missing. His ears are kind of uneven and small. 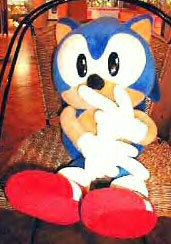 This is a large Sonic with funny fingers. It looks like there may be a buckle on his shoe. 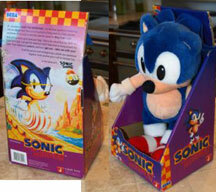 Usually only Japanese Sonics include this feature. This looks like a well-constructed doll. 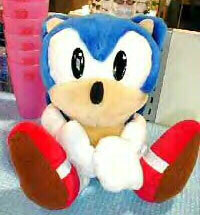 This rather pleasent looking Sonic has soles to his shoes. This plush just seems happy to see whoever is taking the picture, even though you can't see the mouth. It's another of the "Fuzzy" types though, with big fuzzy fingers separated by threads. A stack of cups and a sunglasses sales rack add scale. 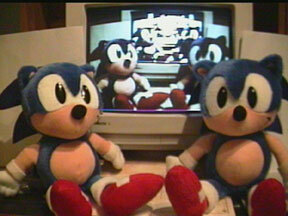 Some nice shots of miscelaneous older Sonics. The row above is sitting on an old-fashion PC monitor. The other shows a clever set up created with a video camera. 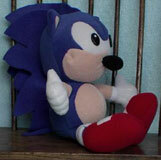 Tomy Toys did a small Sonic plush that had suction cups on the hands and feet so you could stick him to flat surfaces. You can see them near the bottom of the photo. 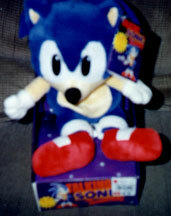 This is a deluxe "Talking Sonic" plush. This was available at Babbages and probably other electronics stores. If you squeeze his body, he says the "SEGA!" scream and makes zooming noises (like running around) so he doesn't actually 'talk' per-se. (Remember this is the "Pre-Urkle" days. Batteries may not be easy to replace. Sound quality may deteriorate, so use caution when buying him. Info courtesy of Steven Matarazzo. Hide the young Sonicfans! The easily offended should run from the monitor, as the worst Sonic item possibly ever done officialy follows this warning message! If you can handle scares, scroll down to view...the pillow. 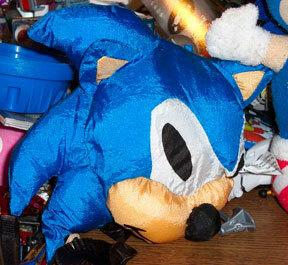 Its a decapitated mutated Sonic head made of some kind of shiny cloth. Look at that tilted pupil eye. The round potato nose. The under-stuffed sagging construction. How does this possibly look any decent from the back? (Hint: it doesn't) It is shown in a contributor's collection, along with a fuzzy plush which is an Avon Terrycloth , and the ReSaurus E-102 Gamma figure. The guilty parties that made this are "Play Faces" and "Play by Play Toys", if you want to yell at them for trying to ruin Sonic.